RV travelers flock to Las Vegas year-round—for the gaming, for the shows and for the 24-hour glitter this desert gem displays like no place else. But there are three more important reasons to consider visiting Vegas by RV, and we’ve gathered them here just for you. Anyone’s who’s visited Vegas knows the hotels, casinos and entertainment venues there are focused on delivering a first-class customer experience. But did you know the RV parks in Las Vegas also offer an impressive array of amenities? Oasis RV Resort, just south of the Las Vegas Strip, not only keeps RVers close to the action, it also offers two lagoon-style pools, grass putting greens, 24-hour check-in, Wi-Fi service and gated security in a Casablanca-themed setting. Arizona Charlie’s-Boulder offers the chance to camp away from the crowds but still enjoy the excitement of Vegas gaming. This hotel/casino/RV park complex is about ten miles off the Strip on Boulder Highway and features a clubhouse, fitness and laundry facilities, four on-site restaurants and plenty of casino action steps from your campsite. Las Vegas KOA at Sam’s Town puts RV travelers in the heart of an amazing range of entertainment possibilities. From the one-hundred-thousand-plus square feet casino to a theater complex, bowling alley, wide range of eateries and an RV park complete with dog parks, swimming pools, Wi-Fi and all the amenities Las Vegas RV campers have come to expect, you’ll find it all out at Sam’s Town on the ‘Boulder Strip’. These are just a few examples of the ways RV resorts in Las Vegas cater to RV travelers. Here’s a link to help you find the Las Vegas RV park that fits your vacation style. Another big plus while camping by RV in Vegas is the surprising affordability of campsites close to major attractions, especially in ‘off-season’. You won’t, of course, enjoy the extreme frugality of state park camping while staying near the Strip, but Vegas campgrounds almost always have some sort of special rate offer available, so be sure to ask when making your reservations. You can also save big while camping in Las Vegas by taking advantage of your well-equipped RV kitchen to prepare some of your meals, saving your vacation dollars for special meals out. Combined with affordable laundry facilities, on-site Wi-Fi and phone connections, shuttle service to the Strip and special entertainment and gaming offers for campers, you can save big while staying and playing in Vegas. or Valley of Fire State Park, having the freedom to travel when and where you please (and not having to depend on tour or shuttle schedules) is one more plus for Vegas RV travel. There’s so much more to see, do and experience near Las Vegas than just the casinos and shows (as exciting as those are!) Immerse yourself in the red rock beauty and magnificent waterways that surround this desert oasis. Your RV is your ticket to travel wherever you’d like, right? Take full advantage of having Las Vegas as your starting point for a true outdoor adventure. If you’ve wondered whether RV travel to Las Vegas is right for you, use these tips to jump start your imagination. Whether renting an RV or planning your next trip in your own vacation home on wheels, camping while in Las Vegas just makes sense. Enjoy the amenities and affordability of Las Vegas RV resorts and be sure to round out your trip by visiting the natural wonders close by. You’ll be so glad you did! You already know when you come RV camping to Las Vegas that you’ll find the casinos, the shows and the architecture like nowhere else in America. Easy access to the Grand Canyon and Hoover Dam make those two wonders natural side trips while visiting, as well. But did you know this desert city is surrounded by thousands of acres of wilderness, just waiting to be explored? If you’ve never seen Vegas beyond the lights, it’s time to find the best spots to hike, bike and photograph just a short drive from the city limits. Don’t miss the stunning red rock formations in this enormous park just west of Lake Mead and an hour northeast of Las Vegas on I-15. Stop by the visitor center first to get a feel for just how special Valley of Fire State Park really is, then choose a trail or scenic drive and get closer. The stunning beauty of gigantic shapes formed by wind and water will capture the attention of everyone in your group. From Mouse’s Tank to the White Domes and Elephant Rock, there’s a trail that will get you there, if you’re willing to venture off the road. There’s even a full-service campground on-site, if you decide to stay another day in the Valley of Fire. About an hour northwest of Las Vegas, with a scenic drive across Red Rock Canyon, RV travelers will find Mt Charleston, the highest point in the Spring Mountains National Recreation Area. The mountains rise up from the Mojave and offer a startling contrast to surrounding desert life. A nicely-planned visitor gateway informs and educates about the wildlife, waterways and geological formations you’ll encounter. Hike through pine forests for views that encompass three states. Take a rocky, streamside trail on a mountain bike. Follow a scenic drive through canyons and forests, in the shadow of limestone bluffs. There are campgrounds, as well, for those who choose to stay outside Vegas an extra day. Imagine this: peace and quiet just a short drive south of Vegas, in the form of a pristine wilderness area. Sloan Canyon is an undeveloped dream of a place, where hikers can set out in search of mountain trails, desert flora and fauna and hundreds of petroglyphs waiting to be photographed. Access the trails from the north by way of the Anthem trailhead in Henderson, NV. Bring what you need! This will be an authentic high desert, wilderness experience. It’s a quick forty minute drive southeast from Vegas to Lake Mead National Recreation Area, where hiking, biking, boating, fishing, swimming and taking scenic drives are just a few of the ways to spend a day trip. The redrock landscape surrounding this waterway on the Arizona/Nevada border is full of secret canyons, rocky trails and Mojave Desert wildlife. Take the bikes along and follow marked trails past windy coves and wilderness landscapes. Drive a scenic loop along some of the lake’s more than eight hundred miles of shoreline. Or put on those hiking boots you’ve meant to use and discover why Lake Mead draws visitors year-round. And when it’s time to rest, the lake itself beckons paddlers and boaters to explore the bright blue waters set against a brilliant landscape. It’s like no other lake you’ll visit on your US RV travels. Those brilliant red cliffs you can see from your Las Vegas campground are waiting to be explored! Red Rock Canyon National Conservation Area, less than an hour west of the city, offers dozens of trails, excellent wildlife watching and a blazing palette of colors for photographers. Follow trails through sandstone canyons, along the base of towering cliffs and through diverse landscapes teeming with plant and wildlife. Keep an eye out for bighorn sheep, fossils, petroglyphs and hidden pools. With so many trails to choose from, you may decide to plan several day trips to Red Rock Canyon, with Vegas as an easy base camp. An RV camping trip to Las Vegas offers gaming, entertainment, fine dining and an amazing range of outdoor adventures. Book your Vegas RV rental now and start making plans to discover a different side of Vegas on your next vacation. Have you ever dreamed of saying, “we’ll be away for the holidays,” but haven’t managed to make that happen? 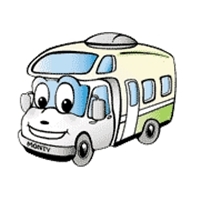 RV travel offers real value for families hoping to hit the road for the holidays. We’re always looking for ways to help our readers plan the perfect vacations, and this holiday season is no exception. Here are five memorable ways to enjoy the winter holidays even more, thanks to the convenience of RV camping. An RV trip to the northeast coast of Florida should always include a stop at Amelia Island. This gem shines with historical and architectural charm, thanks to spots like Fernandina Beach, where entire blocks are on the National Register of Historic Places. You’ll also want to tour Fort Clinch, where the battle over ownership has been waged for more than four hundred years. Beautiful winter weather means highs in the sixties and lows in the upper forties; the perfect holiday RV getaway for snowbound families! There’s an RV camping haven just thirty miles south of Las Vegas that’s a fantastic family-oriented destination. Boulder City, Nevada is not only the gateway to Hoover Dam and Lake Mead National Recreation Area, it’s also a winter wonderland of wildlife viewing, outdoor recreation and historical sites. Take the kids to the city’s Hemenway Valley Park to watch the bighorn sheep graze around the playground equipment! By all means visit Lake Mead and Hoover Dam—they’re both unforgettable—and while you’re there, hike the 3.7 mile Railroad Tunnel Trail, carved through solid rock for the railroad to use to build the Dam. Love to paddle a scenic river trail one vacation day and play on a white sand beach the next? Port St Lucie is the place for you to get away for the winter holidays. The Indian and St. Lucie Rivers that run through this scenic southeast Florida city offer hiking, paddling and fishing opportunities to die for. You’ll also be within easy reach of Florida’s Treasure Coast, where spectacular beaches await. Winter break is the best time of all to hit the beach, and Newport Beach, California is a beach lover’s paradise. Park the RV at one of the many scenic campgrounds in the area and then soak up the sun on beaches like Corona del Mar State Beach and Crystal Cove State Park. Don’t miss the winter grey whale watching excursions and book your campground reservation in time to see the city’s annual five-day Newport Beach Christmas Boat Parade. Want to camp where there’s scenic beauty all around, but big city attractions close by? Fountain Hills, Arizona, thirty quick minutes east of Scottsdale, is your perfect winter holiday location. Next door to McDowell Mountain Regional Park’s miles and miles of hiking and biking trails, this desert town will charm your family into coming back year after year. Hit the shops in Scottsdale, explore the attractions of Phoenix and then get out into the Sonoran Desert for hours of outdoor recreation. Have a golfer in the family? One more reason to stay in Fountain Hills! The Sonoran Desert Golf Trail will lead your golf enthusiast to some of the best public courses in the country. Ready yet to plan this year’s winter holiday RV trip? We’re here to help! Let us book your RV rental and offer plenty of information on local attractions. This is the year to make your family’s best-ever holiday vacation memories.